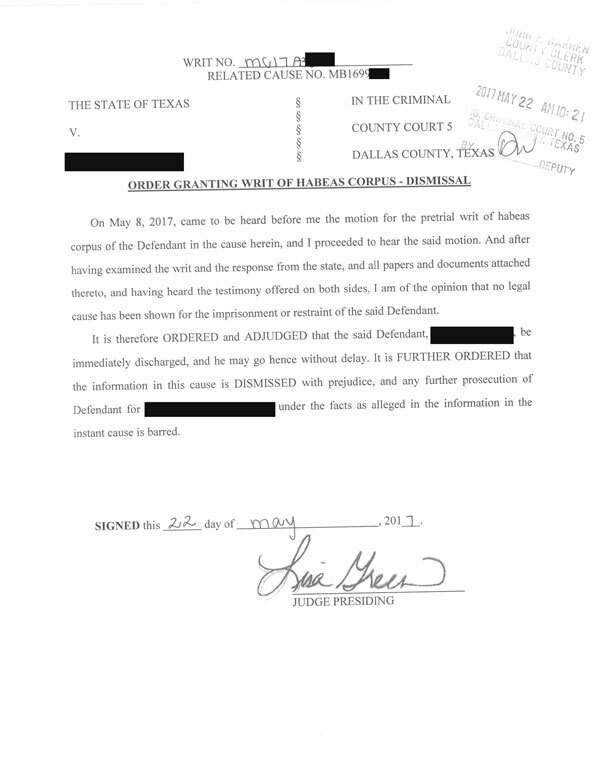 This is an order of dismissal signed by a judge in a successful Writ of Habeas Corpus we argued in 2017. 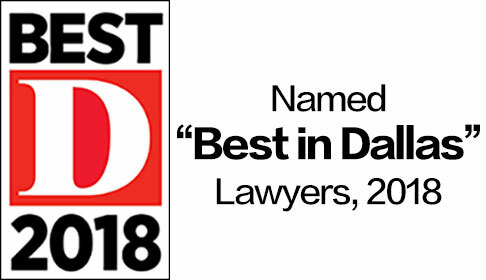 Attorney Paul Saputo represents clients in appellate courts for direct criminal appeals and in trial and appellate courts for writs of habeas corpus. If you have been convicted of a criminal offense, you may be eligible to appeal the conviction through the process of a criminal appeal or through a Writ of Habeas Corpus. There are important deadlines and procedures to follow in order for you to file an appeal, and it is imperative that you contact us early to ensure that everything is handled correctly. What is the difference between a Writ of Habeas Corpus and a Direct Appeal? Are you entitled to an appeal? How do I file a Writ of Habeas Corpus? How do you win a criminal appeal or Writ of Habeas Corpus? The process to get post-conviction relief begins with the filing of a notice of appeal. There are important preliminary procedures to follow as well, but your trial lawyer or criminal appeals lawyer should take care of these immediately as part of your trial representation. Once your notice of appeal has been filed, you will need to obtain a trial transcript and clerk’s transcript. This will form the basis of your appeal. The habeas corpus process is more complicated as it usually involves its own investigation. You can appeal a criminal conviction to the Texas Courts of Appeal, the Texas Court of Criminal Appeals and the United States Supreme Court. Strict time limits apply in appellate work, and it is the the defendant’s (appellant’s) responsibility to file everything in a timely manner. The criminal appellate courts in Texas will hold it against the defendant if he or she file late or improperly. If anything goes wrong, there may be no (or limited) recourse available. In addition to preparing the filings, the firm will need time to strategize and plan your best post-conviction response. So please contact us immediately. 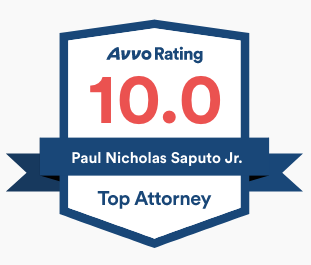 Speak with criminal appeals attorney Paul Saputo now by sending us a message online or by calling (888) 239-9305 to determine your eligibility for any of these forms of relief or to discuss your particular appellate strategy. Criminal appeals ask higher criminal courts to review the law that the judge in the trial court applied, including constitutional law issues and other trial rulings regarding the the conduct of a trial. Writs of habeas corpus can take into account a broader range of issues, but important limitations apply. Article 11.07 of the Texas Code of Criminal Procedure is the Texas statutory framework for habeas corpus. 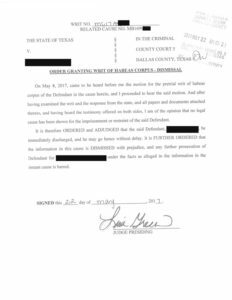 Habeas corpus in Texas is reserved as a remedy of last resort for extreme violations of the constitutional (Texas and Federal) rights of a criminal defendant. Write of habeas corpus are typically a vehicle used to attack the illegal restraint of a person who has been convicted of a felony without any remaining appellate possibilities. If you believe that you should file an appeal or a writ, it is important that you contact us as soon as possible. Once we have discussed your case, if we agree to represent you, we will sign up you or your loved one as a client, interview our client and begin by filing a notice of appeal with the trial court and with the criminal appellate courts. The most important thing you should consider in appealing your conviction is that you will almost certainly be better off if you hire an attorney to handle it instead of doing it yourself. All criminal appeals require legal research and analysis that will need to be compiled into an appellate brief that will be filed with the court. If you hire us, we begin the appellate process by filing a notice of appeal and obtaining a record of the court transcripts, including the trial transcript and the clerk’s transcript. After that, we begin the legal research and drafting of the appellate brief. Eventually the appeal is filed, and sometimes courts of appeal require an in-person appearance for something called an oral argument, in which each side of the appeal argues their respective positions. You are entitled to an appeal under most circumstances after a conviction, unless you have waived your right to appeal as part of a plea-bargain agreement. Please contact us to discuss your particular eligibility. Writs of Habeas Corpus are extremely technical legal processes, although the basic idea is simple: the writ is a request to bring a person before the court and explain why that person is being held against their will. Beyond that basic idea, however, lies an immense amount of legal complexity. Similar to criminal appellate briefs, writs of habeas corpus require legal research. However, unlike criminal appeals, writs also require fact-gathering independent of a review of the trial court proceedings. There are also separate processes for each of the federal level and the state level. Winning a criminal appeal is a challenge. The vast majority of criminal appeals and writs are denied if courts of appeals even look at them. Not every appeal is reviewed on the merits; some are not even looked at by the court. Winning criminal appeals requires skill in research and drafting in addition to having a good set of facts. When we draft appeals, we do intense and deep legal research in addition to rounds of drafting and editing. If the appeal is selected to be heard in an oral argument by the appellate court, we prepare exhaustively for the oral presentation.